What is the Real Cost of Saving Kepler? In March of 2009, the Kepler mission was launched. It was placed in an Earth-trailing orbit around the Sun and observed a patch of sky located in the Milky Way near the constellation of Cygnus to look at thousands of stars to detect any dimming that was caused by a planet passing in front of a star. This mission was by any criterion a great success and racked up an impressive number of discoveries, including the first rocky planets in the habitable zone of a star. However, in April of 2013, one of the spacecraft’s reaction wheels (powered gyroscopes used to control the pointing of the vehicle) failed. One had failed earlier, but there were still enough wheels for the mission to continue. This time was different. Kepler was placed into a safe mode which allowed it to communicate to Earth. For the next three months, various strategies were tried to see if the reaction wheel that failed earlier could be restarted. It was restarted but did not function well. Then, some on the team had a stroke of brilliance. After doing the complicated math and computer simulations, they came up with a way to save the mission by using the pressure of solar radiation (a major cause of instability to Kepler) as a means to help keep the spacecraft stable. 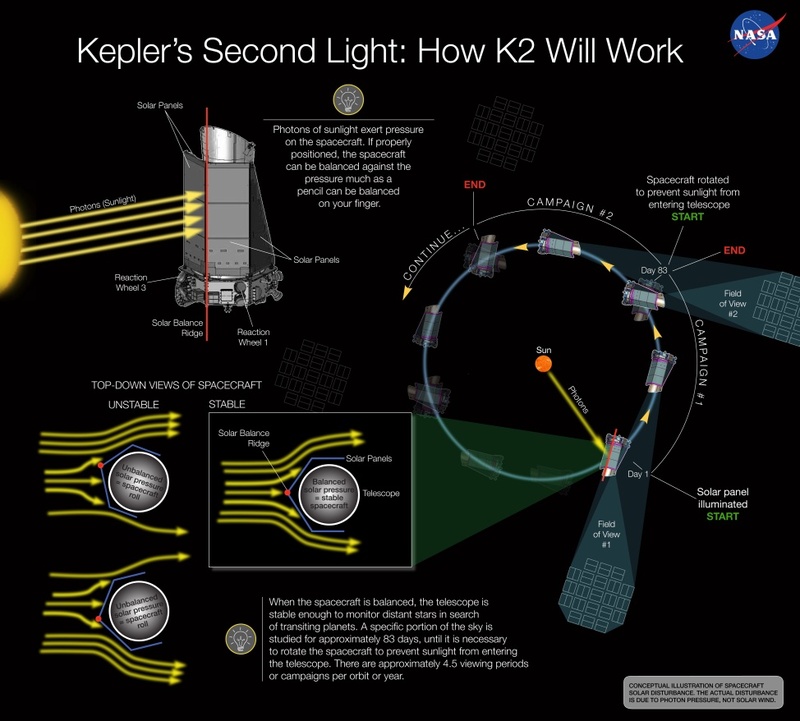 NASA liked the idea, known as “K2” (no connection to the extremely dangerous Himalayan mountain of the same designation) and depicted in the above diagram. So, Kepler was saved, but at what cost? In terms of dollars and cents, it was a great bargain. However, when it came to Kepler’s capabilities, it turns out to be an almost Faustian deal. The great strength of the original Kepler mission was that it kept one well-known section of sky under continuous surveillance. That way, Kepler would not miss anything that took place. As a result, Kepler discovered planets of longer periods and was able to observe the three transits required to confirm the discoveries. The success of this strategy can be seen in the large number of planet discoveries from the mission. Due to the use of solar radiation pressure as stabilization, Kepler has to be pointed at the ecliptic plane (the plane where the planets of the solar system tend orbit). That doesn’t sound so bad, but since the Sun appears in the ecliptic plane, Kepler has to move to observe another field about every 83 days so the Sun doesn’t shine into the instrument and burn out the detectors. Factoring in the time it would take to adjust Kepler each time it moved to one of the eight fields, that yields less than 83 days per field. So, the concept of continuous surveillance goes right out the window. Since a “year” for Kepler in its solar orbit is 379 days and only about four and a half fields can be observed in one Kepler “year”, that means quite a bit of time will pass before it returns to a field for further observation. A lot can happen in that time and a many potential planets will be missed. Mission scientists naturally downplay this and claim that the increased number of viewing locations will make up for it. True, there will be some discoveries made from the K2 mission, but they won’t be anywhere near as numerous due to the spotty nature of the observations. If you are a fan of extrasolar planets, you better get used to most of the new discoveries being hot Jupiters, hot Neptunes, and lava worlds, rather than the more interesting habitable zone planets, because the short duration of observations in each field will favor the planets with really short orbital periods, even with the new policy of requiring only two repeat transits to confirm a planet instead of three. And this approach of observing lots of area for shorter intervals appears to be the wave of the future in searching for extrasolar planets from space. If you like the K2 mission, you’ll love the followup mission to Kepler called TESS (Transiting Exoplanet Survey Satellite) which will survey most of the sky while in an eccentric Earth orbit with little time devoted to each field. You can read the full gory details about K2 here. Is the new strategy of observing more area in less time worth it for extrasolar planets or should there be a return to more time in less area in the future?